I'm excited about this post because I have tea to giveaway! In the absence of being able to have a Christmas tea gathering for all of my bloggy friends, I'm very happy to have a chance to mail some tea to you. We can drink it together in spirit. In the past few months I have been come something of a tea snob, I'm afraid. I'm a huge fan of Republic of Tea and drink their blends exclusively. I haven't tried one that I haven't liked. I was excited to see their new Christmas teas, especially the Gingerbread (it's fantastic) and the Peppermint Bark. In the past I have been a fan of their Peppermint Cuppa Chocolate (I'm still a fan) but I wasn't sure how different the Peppermint Bark would be from the other. 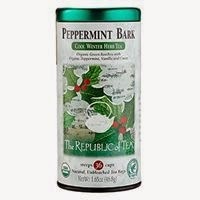 Republic of Tea offered to send me a sample of Peppermint Bark and I appreciated the chance to compare! I am almost astonished (though why I shouldn't be, I'm not sure) to say that the Peppermint Bark is quite different from the Peppermint Cuppa. The Peppermint Bark tastes exactly like candy. It's like sipping calorie-free christmas bark. What's to complain about? This tea is delicious! I have served this to quite a few of my friends lately and it has been enjoyed to a person. Therefore I'm delighted to have the opportunity, thanks to Republic of Tea, to send a sample tin to one of you. This is an herbal green rooibos tea. The ingredients list is as follows: organic green rooibos, organic peppermint, organic cocoa extract, organic vanilla flavor, organic stevia leaf and natural flavor. There are 36 natural, unbleached tea bags included in the tin for your enjoyment. If you would like to win this, please leave a comment below. Be sure to eave a valid e-mail address! This contest is open to U.S. Residents and will be open through Monday, December 1st. I trust you and yours will enjoy it. I'm sipping a cup of it as I type this post up, in fact. It's the perfect tea to celebrate the holidays with. THIS CONTEST IS NOW CLOSED. THE WINNER, as selected by Random.org, is #1 - Heather! CONGRATS! Many thanks to Republic of Tea for offering a sample to one of my readers here at Reading to Know. Additional note: Republic of Tea's blends can be purchased locally but I've found that it's cheaper to place orders when they run their Free Shipping specials. I order enough at a time to tide me over until the next special runs. However, if you are interested in ordering limited quantities, they are now offering a flat rate shipping fee which is indeed helpful! heatherliz dot carrillo at gmail dot com. heatherlaaman at gmail dot com. I'm preferring the latter, though it is taking me forever to switch all my stuff over. Including my blog. I don't even want to TALK about how annoying that is. Yes! Loved the little treats you sent me last month! :). I don't know of a local source for these, but I'm mightily tempted by your free shipping suggestion. Have you tried the Ginger Peach tea? It's one of my favorites! I've never tried this brand before. You sure make it sound yummy! My parents love ROT! Thank you! Oh, how I love the Republic! Mmmm! This makes me want some of their new teas now. :) I did put several on my Christmas list. I can find Republic of Tea at our local international market, but I'll definitely check out their website. Peppermint Bark sounds really good! Um, yes please! I love roobis (but can't spell it) and peppermint bark and chocolate so this just sounds heavenly! Yes, yes, yes. : ) Me please! I've experimented with different teas, but I only recall liking one. Some tasted like dirt. :P I really want to like it, though, and I've never given The Republic of Tea a chance. My husband and I both love peppermint tea.